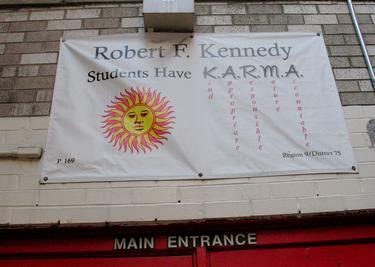 A few years back I wrote in this space about a public school in New York City that was utilizing the Hindu concept of karma to teach good behavior to its students, as evidenced by prominent signs both outside and inside the school referring to karma and relating it to specific behaviors. That was the Robert F. Kennedy school (PS 169) on the upper east side of Manhattan. 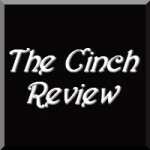 The ultimate point of my piece was to highlight the double standard inherent in this vast official employment of a Hindu religious concept in an American public school, whereas posting the Ten Commandments or the Beatitudes would have brought speedy intervention by those who are out there trying to protect young and impressionable minds from any Judeo-Christian influence. Why would the latter amount to a “state establishment of religion,” while plastering the entire school with postings about karma was regarded as entirely benign? I concluded that I didn’t really have a problem with the karma stuff, if it worked, but I did have a problem with the message implicitly being conveyed to students that Hindu religious concepts are fine to teach and follow, while the banned Judeo-Christian ones must be somehow toxic. Police allege that a 13-year-old male student at the school was “menacing” other students with a .22-caliber revolver. This was the fourth known incident of a gun being brought by a student to a New York City school since the beginning of the year. Unfortunately, the poster neglects to list pistols, revolvers and ammunition—unless “etc.” can reasonably be interpreted to include such items. Now, I do not take delight in bad things going on at the school of good karma: these things can happen regardless, and a 13-year-old who brings a handgun to school is a 13-year-old who is not being brought up properly at home by his parents and/or guardians. 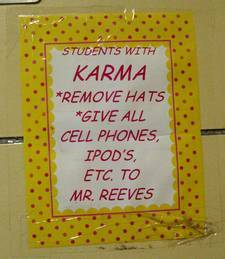 Which would have more resonance with them: cutesy signs about karma, or the Ten Commandments? Still, it raises again the question of how a school chooses to promote good behavior. I’ve seen the students going in and out of this school, and if you saw them too I think you would agree that precious few of them are likely to be ethnically linked to the Indian sub-continent. Given their ethnicity, in fact, the vast majority can be presumed to be of a Christian background, nominal or otherwise. So which would have more resonance with them: cutesy signs about karma, or the Ten Commandments? Would “Do unto others as you would have them do unto you”—the words of Jesus Christ from Luke, Chapter 6—possibly carry weight and potentially remind them of obligations worth remembering? It won’t happen, of-course. That battle is lost. Not only is teaching the Bible effectively banned from U.S. public schools, but the very memory of it has been overwritten by other ideas and concepts: sometimes just fluff, and sometimes pushing a marked social and political agenda. Has all of this made U.S. society better? Or is the void so created getting larger all the time and sucking the nation down into it? 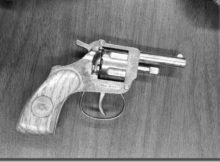 The handgun the police took into their possession at the Robert F. Kennedy school last week was, as mentioned, a .22-caliber revolver. 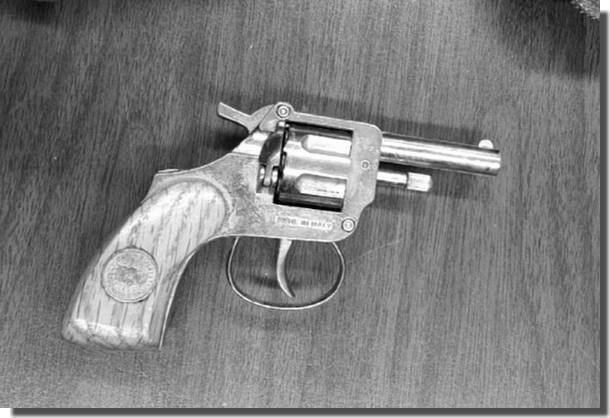 And in the early hours of June 6th, 1968, it was a .22-caliber revolver that was used by Sirhan Sirhan to kill Senator Robert F. Kennedy.